At last year’s Pikes Peak Writer’s Conference I was surprised by just how much new information came my way. It was like trying to cram a masters level course in one weekend. I wound up filling two legal pads full of notes. Notes which I foolishly promised that I would transcribe. Here we are almost a year later and I’m only about halfway done transcribing all my chicken scratches into typed notes. I knew that I would need a different solution by the time the Rocky Mountain Fiction Writer’s Conference came around. In the past, I had relied on my HP TC1100 tablet PC. This allowed me to write directly onto the screen with a stylus and even incorporated handwriting recognition. However, I had sold my TC1100 since it was showing it’s age (HP had discontinued that model back in 2005). My new laptop, an Alienware M11x, works great if I have a little desk to work from, but many of the workshops and classes at the conferences were packed to capacity and didn’t have room. I had to count on a solution I could put on my lap and while the M11x will fit on my lap easily, typing that way for a long time just isn’t practical. My iPad, as nice as it is, really doesn’t lend itself to note-taking with a stylus. (Note to Apple: You already have my money, but incorporate handwriting recognition or actually pen-sized note-taking in a future iPad and you’ll get more!) I needed something that didn’t behave like I was writing with a fat magic marker. So I cast about the internet looking for a new solution. I briefly considered purchasing a new tablet PC. But the price proved prohibitive as well as a duplication of effort with my superior M11x. I nixed that. I tried various styli for the iPad, none of them got me the results I needed. 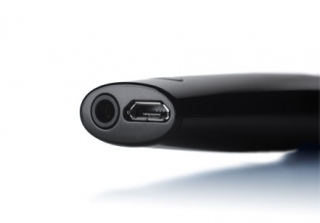 Then I found the Livescribe Echo Pen and my problems were solved…and then some. 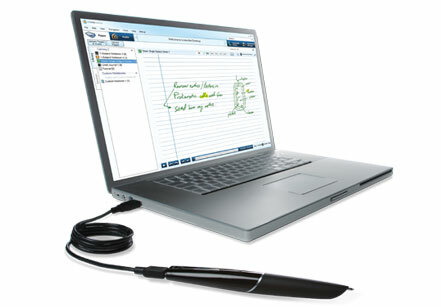 What Livescribe has done is wonderful, it is a near perfect blend of the analog and digital world. 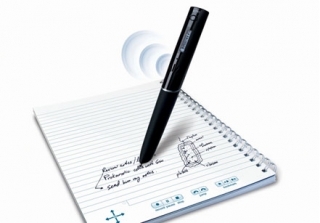 Rather than reinvent the wheel (or pen in this case) Livescribe simply created a better one. 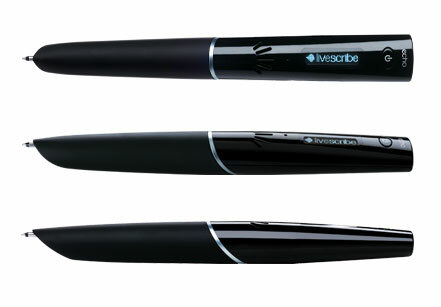 Livescribe smartpens, the Pulse, and the newer Echo, literally record your handwriting and store it. When you dock your pen with your computer you can download your notes, in your own handwriting! So how does it work? The tip of the pen contains a tiny IR camera. You have to use Livescribe’s special dot paper, but that is not as bad as it sounds. Livescribe provides a wide variety of notepads, notebooks, journals, even post-it notes! Their desktop software even allows you to print your own paper if you’re worried that you’re going to run out. Control ‘buttons’ on the paper allow you to control the pen giving you access to various applications (yes, apps for a pen!) ranging from dictionaries, musical instruments, calculators, and even games (displayed through the LCD window on the top of the pen). If this is all the pen did, it would be incredible. But there’s more. Where the pen really shines, is that it has a microphone and it can record extremely well. But the pen doesn’t simply incorporate a digital recorder. It incorporates a digital voice recorder that synchronizes itself with your handwriting. Later, if you were wondering what that enigmatic scribble means in the corner of your notes, you can touch the pen to the writing in the notebook and it will play back the audio that corresponds to the time when you made that scribble. On top of all that, you can export to a PDF or something called a ‘pencast’ which is an interactive recording of your notes married with the audio. 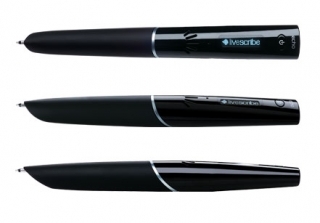 Once you dock the pen with the computer, you can use Livescribe’s connectors to send email, link to Facebook, send to Evernote, Google Docs, and apps on your mobile devices, even use it to emulate a WACOM like tablet with the right apps. For the most part, it works seamlessly. 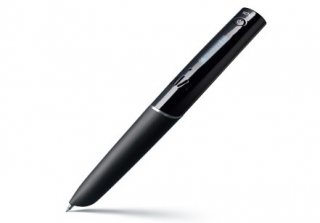 Right now, one of the few drawbacks of the pen is that you have to physically sync it to the Livescribe Desktop. This isn’t so much a drawback as it is potential for a future feature (I hope!) The pen screams for wifi or Blutooth connectivity. Personally, I’d rather see them just go to Blutooth and let people’s mobile devices do the heavy lifting of the wifi connectivity. So, to bring things full circle, I attended the Rocky Mountain Fiction Writer’s Conference with my new Livescribe Echo pen in hand. All my notes were transcribed in a matter of minutes after I returned from the conference. And because I imported them into Evernote, they can be indexed and are searchable. All the audio is still there. The critiques from my novel workshop? I have them all and can play back the audio from the entire workshop. My pitch meeting with a very cool editor? Not a worry. No longer will I walk out of a pitch meeting wondering if I forgot a critical piece of information. Even if I didn’t write it down, it’s in the Livescribe Echo Smart Pen. I won’t attend another conference without it. And not that I would ever use it for such a thing, but did I mention you can play “Zork” with it? I’ve seen your setup and been intrigued for a while. I’m balking at the cost of another convertible laptop at the moment. This review was very useful. Food for thought. One thing I should add is that I bought the 8GB pen, which, unless you’re a college student and taking a ton of notes, is probably overkill. Also, right now, though I think it ends in April, they have a deal where if you buy the 2GB pen you get a free year of Evernote premium.